BSF Recruitment 2019 Notification:: The Border Security Force (BSF) has invited applications for the post of head constable (radio operator) and head constable (radio mechanic) at its official website, bsf.nic.in for both male and female candidates. 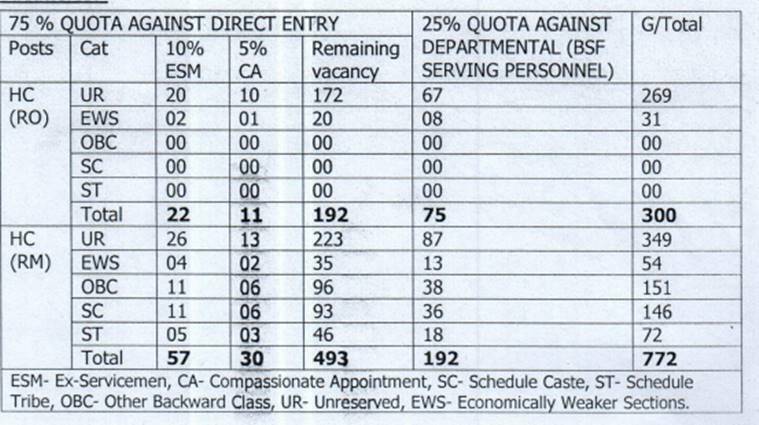 A total of 1072 vacancies are on offer through this recruitment drive. The online application process will begin from May 14, 2019 at 1 am and will conclude on June 12 at 11:59 pm. Candidates will have to appear for a written exam followed by physical standard and physical endurance test (PST/PET) followed by descriptive test and final medical exam. Age: Candidates should be at least 18 years of age to apply for the job but the upper age limit is capped at 25 years. For those belonging to OBC category, the upper age limit is 28 and for SC, ST category candidates it is 30 years. Education: Candidates should have cleared class 12 or equivalent with physics, chemistry, mathematics from regular mode and should have 60 per cent marks at least or should have a two-year industrial training institute certificate (ITI) in radio and television or general electronics or related field. The link to apply has not been activated yet and will be activated from the scheduled date only. Selected candidates will be hired at the post of Rs 25,500 to Rs 81,000 per month and additional allowances including DA, ration money, dress allowance, HRA etc will also be granted.